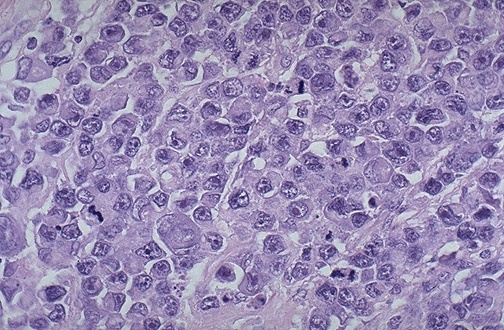 The malignant lymphocytes here are very large with a moderately abundant cytoplasm, and the nuclei are round to ovoid with prominent nucleoli and occasional mitoses. The diagnosis is diffuse large B cell lymphoma (also known as immunoblastic lymphoma). The major differential diagnosis in this case would be a metastatic carcinoma. The presence of monoclonal immunoglobulin as demonstrated by immunohistochemical technique would help to confirm this lesion as a malignant lymphoma. Demonstration of CD19 and 20 antigens would classify it as B cell in origin.